You might ask why it would be useful to think about music when reading Milton's poetry. The poetry we often associate with music is intended to be sung: it is usually short, it probably rhymes and has a repetitive structure (verse, chorus, verse, chorus) - everything which Paradise Lost is not. Nevertheless, when defending his choice not to use rhyme for his great epic in the prefatory section on 'The Verse', Milton writes in terms of 'musical delight', and only six lines into the great epic, he cries out 'Sing heavenly Muse'. Musical concerns are never far away from Milton's field of reference, and an understanding of the music of the period can enhance a reading of his poetry. The importance of music in Milton's poetry comes as no surprise when we consider the home in which the young poet grew up. His father had been a chorister at Christ Church Cathedral in Oxford, and although he did not become a professional musician, he continued to perform and compose music throughout his life. The older Milton was one of the foremost amateur musicians of his day, and his music appeared in print alongside many of England's finest composers, including William Byrd, John Dowland and John Bull. He even contributed the words and music of 'Fair Orian' to Thomas Morley's collection of madrigals in honour of Queen Elizabeth, The Triumphs of Oriana (1601). The musical accomplishments of John Milton the Elder had a strong influence on his son. Many of the younger Milton's early biographers pay tribute to the poet's skill as a musician: 'Hee had an excellent Ear, and could bear a part both in Vocal and Instrumental Music', states one anonymous account. Most famously, Milton was an accomplished organist: one (unproven) tradition holds that Milton played the organ now at Tewkesbury Abbey for Oliver Cromwell. Milton's friendship with the composer Henry Lawes must also have encouraged the poet's musical interests: Lawes and Milton collaborated on the music and words of the masque commonly known as Comus in 1634. When Milton planned to tour the Continent in 1638, Lawes used his influence with the Warden of the Cinque Ports to facilitate the poet's travel to Italy. Milton appreciated Lawes' songs because of the clarity of his word-setting. His sonnet, 'To Mr H. Lawes, on his Airs' praises his friend's music for the ways in which it serves the needs of the lyric, unlike much contemporary English music, which frequently obscured the meaning of the words. Unfortunately there is a further complication, which is most clearly explained by dividing music into practical performance ('musica practica') and speculative theory ('musica speculativa'). Our modern, familiar ideas of musical performance would be covered by the term musica practica; but musica speculativa is alien to us now, and requires explanation. Speculative music theory developed from the experiments of Pythagoras in the sixth century BC. Pythagoras, passing a blacksmith's shop one day, is supposed to have heard the sound of several hammers beating out a piece of iron, and noticed that each hammer created a different note when it hit the anvil. Inspecting the hammers, Pythagorus recognised that one hammer, half the size of another (that is, the ratio 1:2), produced a note an octave higher than the second (eight notes apart - the interval between two Cs on a piano). Further experiments with gut strings - like those on a violin - confirmed the relationship between music and mathematical ratio: he discovered that the intervals of the perfect fifth (between C and G five notes higher) and perfect fourth (the interval between C and F) also corresponded to the neat ratios 2:3 and 3:4 respectively. These precise details are of little importance here, but it is important to recognise that Pythagoras' experiments forged the connection between music and abstract mathematics, the founding principle of musica speculativa. Music came to stand for much more than simple entertainment: it held within it the key to understanding the construction of the universe. From these experiments into the mathematical nature of music, Pythagoras and his followers derived a musical model of the universe. Inheriting the idea of the earth surrounded by concentric spheres, Pythagoras suggested that the spheres created musical sounds as they moved, corresponding proportionally to their size and position. From a modern perspective, this all seems very difficult to take in; nevertheless, this idea of the 'music of the spheres' has been particularly resonant throughout history - particularly during the Renaissance, with its interest in reviving Classical ideas for a contemporary audience. As Pythagorean (and later, Platonic) ideas were reinterpreted to suit a Christian world view, the concept of harmonia mundi ('world harmony') became a powerful metaphor for thinking about God. This Pythagorean view of the special significance of music is most evident in Milton's early poetry. 'At a Solemn Music', the long Latin poem Ad Patrem ('To my Father'), and the musical passages from 'Arcades', Comus, and 'On the Morning of Christ's Nativity' are all particularly helpful in establishing some idea of Milton's understanding of harmonia mundi. 'Disproportioned' resonates with the Pythagorean ideas of music as proportion or mathematical ratio: at the Fall, the music of earth became as broken and imperfect as the humans that made it. While both of these examples emphasise the imperfection of human music, they also point towards the perfection of the music of the spheres - or, in Milton's Christianised model, of God and Heaven. 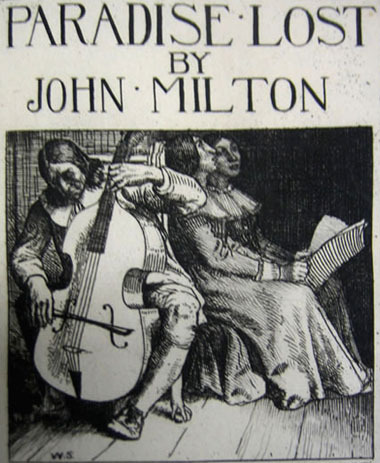 At least until the Fall in Book IX, Paradise Lost is rich with musical imagery. Milton frequently refers to musical instruments, each ringing with its conventional associations. It is particularly useful to notice references to the organ, important for its versatility and range, as well as because it was Milton's own instrument (though beware, as it may on occasion be used as a synonym for 'instruments' more generally). Echoes of the perfect music of Heaven can still be heard in the 'partial' music of the disgraced angels - and, for that matter, the 'broken' music of fallen man. These examples briefly illustrate the ways in which the ideas of harmonia mundi became a rich source for Milton's poetic imagination, but they are by no means exhaustive. These concepts re-emerge, for example, in Milton's description of the 'cosmic dance' of the planets and the angels in Book V (620-24), or the account of Creation in Book VII, accompanied throughout by angelic music. Considering Milton's blindness and his dependence upon hearing in later life, ideas of music might also be relevant to a discussion of the aural qualities of his verse. Musical discourse enriches Milton's writing, and can be a productive approach to reading his poetry. Ernest Brennecke Jr., John Milton the Elder and His Music (New York: Columbia University Press, 1938). Good for information on Milton's father, and helpful for understanding the musical influences on the young poet from an early age. John Hollander, The Untuning of the Sky (Princeton, 1961). A discussion of ideas of music in English poetry between 1500 and 1700, including a substantial section on Milton's use of these ideas in his poetry. Jamie James, The Music of the Spheres (London, 1993, repr. 2006). An easy to read, helpful introduction to the confusing concepts raised by ideas of world harmony, the music of the spheres, and the relationship between mathematics and music. David Lindley, Shakespeare and Music: Arden Critical Companion (London, 2006). Includes a useful section explaining clearly the ideas and concepts behind Renaissance musical theory. Sigmund Spaeth, Milton's Knowledge of Music (New York, 1973). Spaeth discusses the historical background to the music of Milton's day, and Milton's practical knowledge of music, explaining many of the technical terms he comes across in Milton's poetry. He comments on how an understanding of Milton as a musical poet can influence our reading of his poetry. The book also includes a useful appendix of the more substantial references to music in Milton's poetry. There are very few recordings of the elder Milton's music available. Milton's Madrigal 'Fair Orian' appears on The Triumphs of Oriana, recorded by I Fagiolini, conducted by Robert Hollingworth (CHAN0682), along with other works from Morley's collection of Madrigals, giving a sense of the musical background of the poet's childhood. Milton's poetry has also been the source of inspiration for many composers. The music of the Lawes brothers - contemporary with Milton's poetry - is widely available on CD. Handel's oratorio Samson is closely allied to Milton's poem 'Samson Agonistes', and his hybrid ode/oratorio 'L'Allegro, il penseroso ed il moderato' is based on Milton's poetry. The Victorian composer C.H.H. Parry also set 'L'Allegro and Il Penseroso' (1890); 'Blest Pair of Sirens', Parry's setting of 'At a Solemn Music', is more frequently recorded. More recently Hugh Wood (b.1932) was inspired by Milton's verse to compose his symphonic cantata 'Scenes from Comus' (itself the starting point for Geoffrey Hill's 2005 collection of poetry of the same name, published by Penguin). Wood's cantata is available on NMCD070.